Indian civilization is a child of the Vedic Rishis. Who are these Rishis? They are not small- time saints, cloistered monks or half illumined nay-sayers who turned away from the world as an illusion. They are some of the mightiest spiritual personalities of the world and the earliest visionaries of integral spirituality. They saw the light of Truth with their inner vision and heard the voice of Truth with their inner ears and expressed what they saw and heard in cosmic metres, which are the Vedas. The keyword of their synthesis is not renunciation but integration. They embraced heaven and earth, sacred and the secular, world and God in their vast consciousness without any distinction. They are the great ‘civilization builders.’ Their vision and word gave birth to the Indian civilization. Unlike the modern mind, which moves from outer appearance to the deeper truths, the Vedic sages saw with their vision the deepest, inmost and universal Truth and organised the outer life in the light of this higher vision of Truth. They saw and knew not only the truth of the spirit but also the deepest truth and law of the world. The Indian mind regarded the Rishi as the best guide and leader not only for the spiritual life but also for the secular or worldly life because the true Rishi had a deeper and better understanding of the world than the world of man or the scientist or the secular thinker. But in India, this Rishihood is not confined to the Vedic age. The soul of India is still giving birth to Rishis. The traditional religious mind of India looks back to the “glorious past” for spiritual inspiration and wisdom, as if spirituality is the exclusive preserve of the past and there is nothing of it in the present or future. What is not fully recognized is that spirituality in India is an unbroken and constantly renewed tradition. There was never a period in Indian history without some well-known or unknown sages, seers or saints standing as pillars of Light, radiating the light and love of the Spirit into the world. This great spiritual quest of India continues even in our modern age, exemplified in the life and realization of many well-known spiritual masters like Sri Aurobindo, Ramakrishna Parahamsa, Ramana Maharishi, Mata Amritananadamayi and many other less known and unknown yogis all over India. Hello, the whole thing is going perfectly here and ofcourse every one is sharing facts, that’s truly good, keep up writing. 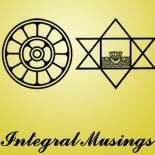 This entry was posted on August 11, 2015 by integralmusings in Indian civilisation & Culture.